Comets made up of two lobes, such as Chury, visited by the Rosetta spacecraft, are produced when the debris resulting from a destructive collision between two comets clumps together again. Such collisions could also explain some of the enigmatic structures observed on Chury. This discovery, made by an international team coordinated by Patrick Michel, CNRS researcher at the laboratoire Lagrange (CNRS/Observatoire de la Cote d'Azur/Universite de Nice-Sophia Antipolis(1)). Ever since Giotto visited Halley's comet in 1986, a few spacecraft have flown close to several cometary nuclei. It turns out that most of them appeared to be elongated or even made up of two lobes, such as the well-known Chury, which was observed at very short range by the Rosetta spacecraft in 2014 and 2015. Astronomers believe that this astonishing shape can be explained by the merger of two formerly separate comets. The two comets would have to exhibit very low density and be rich in volatile elements, and therefore be moving very slowly, to enable them to come together and collide gently without exploding. For a number of reasons it is usually assumed that this type of gentle encounter only occurred in the initial stages of the Solar System, more than four billion years ago. However, there remains a mystery: how could such fragile bodies of the size of Chury, formed so long ago, have survived until now, given that they are constantly subjected to collisions in the regions where they orbit? An international team, including in particular a French researcher at the Lagrange Laboratory, now proposes a completely different scenario, using numerical simulations partly run at the Mésocentre Sigamm at the Observatoire de la Côte d'Azur. 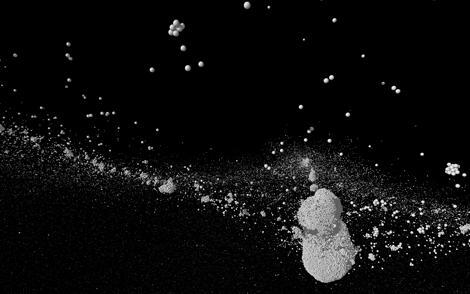 The simulations show that, during a destructive collision between two comets, only a small part of the material is pulverized at high speed and reduced to dust. However, on the sides opposite the point of impact, materials rich in volatile elements are able to withstand the collision and are ejected at relative speeds low enough for them to attract each other and re-accrete, forming many small bodies which in turn clump together to form just one. Astonishingly, this process only takes a few days, or even a few hours. In this way, the comet formed keeps its low density and its abundant volatiles, just like Chury. This process is thought to be possible even in impacts at speeds of 1 km/s, which are typical in the Kuiper belt, the disc of comets extending beyond Neptune where Chury originated. Since this type of collision between comets takes place regularly, Chury may have formed at any point in the history of the Solar System and not necessarily at its beginnings, as previously thought, thus solving the problem of its long-term survival. This new scenario also explains the presence of the holes and stratified layers observed on Chury, which would have built up naturally during the re-accretion process, or later, after its formation. A final point is that, during the collision that forms this type of comet, no significant compaction or heating occurs, and their primordial composition is therefore preserved: the new comets continue to be primitive objects. Even if Chury formed recently, analyzing its material will still enable us to go back to the origins of the Solar System. This study was funded by the CNES and Academies 2 (Complex systems) and 3 (Space, environment and hazards) of the Idex Jedi at the Universite Cote d'Azur.